A Houston jury sentenced 24-year-old Jessica Tata to 80 years in prison for the death of 6-month-old Elias Castillo. Watch the sentencing. A Texas woman convicted of murder after a fire at her home day care resulted in the death of four children was sentenced Tuesday to 80 years in prison. Last week, Jessica Tata was convicted of felony murder in the February 24, 2011, death of 16-month-old Elias Castillo. The child was among four kids who died after Tata left a group of children alone in a Houston home with a pan of oil cooking on a hot stove. She had gone shopping at a nearby Target store when the deadly blaze broke out. Three other children were injured. In addition to the 80 years of prison time, Tata was ordered to pay a $10,000 fine, The Associated Press reported. The punishments came after the sequestered jury deliberated Tata's sentence for 5-1/2 hours on Monday and resumed discussions Tuesday morning. 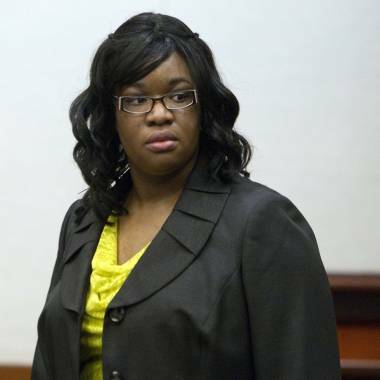 Home day care operator Jessica Tata was convicted of murder on Nov. 13. Tata will be eligible for parole in 30 years, according to the Houston Chronicle. The 24-year-old didn't say anything after the verdict was read, according to Houston's NBC-affiliate KPRC. On Monday, prosecutors asked the jury to sentence Tata to life in prison, arguing that the now-24-year-old "doomed" the children when she left them home alone, the AP reported. In addition to Castillo, 20-month-old Elizabeth Kojah, 20-month-old Kendyll Stradford and 3-year old Shomari Dickerson died in the fire, according to KPRC. "What each mom will do to hold their baby one more time," prosecutor Connie Spence told jurors, according to the AP. "What's a child's life worth? ... What we want is justice." Tata's defense attorneys had asked jurors to not be swayed by anger, claiming that Tata was a good person who made a terrible mistake, the AP reported. "She (Tata) called them her babies" attorney Mike DeGeurin told jurors, according to the AP. "She didn't want those babies to be harmed." After the fire, Tata fled to Nigeria but was later captured and has been in jailed in the U.S. since March 2011, the AP reported. She has Nigerian citizenship, though she was born in the United States. Tata still faces three more counts of felony murder for the other children who died, the AP reported, as well as three counts of abandoning a child and two counts of reckless injury to a child for the three who were hurt. Is serial killer targeting NYC shopkeepers?